This supportive and safe group experience will change your life! 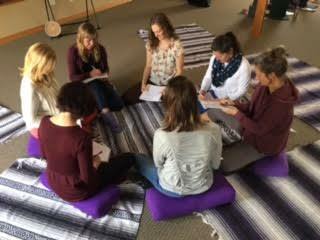 We explore a new theme each week through gentle yoga and other movement, meditation, quiet reflection, and group experiences. As you journey through these themes, your understanding of your WHOLE SELF will deepen, and you will reconnect to what really matters to you in your life. Each class will include exercises and movements that focus on the theme for the week. We will engage in embodied movement, including yoga; silent and guided meditation; and time integrating what you notice about yourself and your life, in relation to the theme. What distinguishes this group from other yoga or meditation classes is a focus on doing things mindfully. Each week you will be asked to notice what happens moment to moment in your mind, body, and heart. It is through this dedicated attention to yourself that you will become more clear about the choices you are making in your life, and through this awareness begin to make new choices. Stop just "getting through" your life, and thrive. Be heard and witnessed by yourself and others, in a unconditionally accepting environment! Contact me for a free Q&A about the group! Register for a Free Phone Consultation ! NEXT CLASS BEGINS MAY 11th at 12:30! !